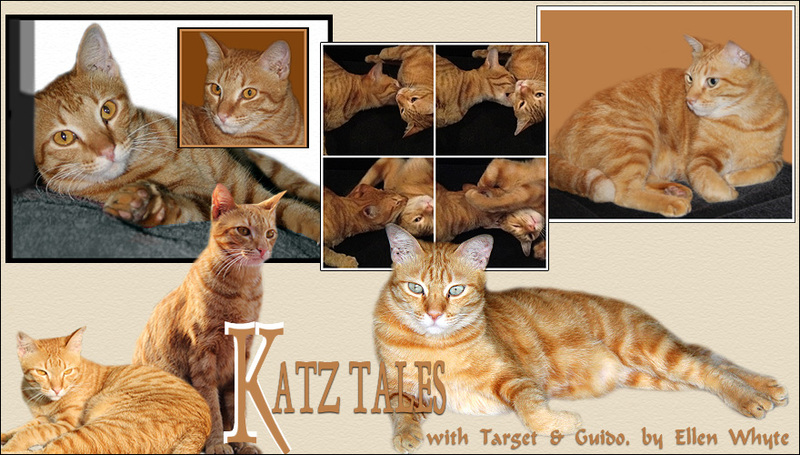 Katz And Other Tales: COT: We're BACK! We've had problems with our "broadband" service (it was slower than a 28K modem!!!!) 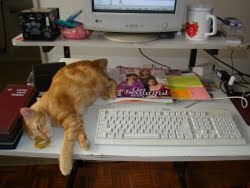 We've had problems with Blogger. We've had problems with our blog. Now we're BACK and happy to be out and about again. We're still trying to keep to the old URL but that may not be possible. I'll know on Friday and will post a note then. Visiting you all this week! Au has a small abscess on his cheek. We went to the vet yesterday who checked Au out and put him on pills. Au is fast asleep now but I'll take a picture of him and post an Au Speaks Out on Friday. Target is fuzzy and purring as always. Here he is with his snizzle circle under his chin and all curled up on my desk. I'm rearranging my office so we're rather busy this week. But by Friday I plan to have a snazzy work place!! About Boris: Boris is now living with a retired lady teacher. He has finally achieved his dream and is a lap cat. He's also got a garden and is out and about for (very short) walks. He's keen to be inside, having to live on the street for so long. I'm visiting him later this week. BEST OF ALL: BORIS NO LONGER SPRAYS! This confirms neutering a 2 year old boy has great results. For more cats, check out Gattina's Cats on Tuesday. Yeah for Boris!! Welcome back! awww, target looks like a soft toy there. i just wanna squeeze him till he's blue. I know how you feel with the 'broadband' service where the cursor kept turning and turning and turning...till you give up. Hope Au is feeling better soon and glad to hear about Boris! No spraying is a LOVELY thing!! I thought I was going to have internet problems today too, but all is well in blog land. Hope your Au heals fast, yea Boris, and Target is darling!! I am glad you are back. I have missed you, Target & Au. Hope Au is feeling much better. Can't wait to hear what Au has to say. My Miles does NOT like Thumper and Humpty, the "new" boys, so he has a habit of peeing in my son's bed. we have to keep his door closed. Problemen met blogger ja ja dat hoor je vaak maar ja wat doe je eraan !! Yay! Welcome back! I was missing you! And Yay for Boris! No more spray! I hope Boris and woman have a lovely life together. I hope Au feels better really soon! Looks like you are all well settled in your new blog. Hope Au is feeling better with her cheek. Nee ze komen oorspronkelijk uit Mongolie . Het is hier een heel groot natuurgebied in Limburg. Voor mij is het niets speciaals ik zie ze iedere dag. Zie ik tenminste meteeen als je een nieuw blogje hebt gemaakt !! Welcome back, furiends! Sorry about the cheek abscess, Maggie had one on her leg. It's all better now. Hope Au's abscess clears quickly. We are so happy to hear the news on Boris, that is fabulous!!! Target is a handsome guy, it is great that he stays close to the computer to keep us updated. I hope Au gets all better very soon. Have a fun busy week! We are sending Au lots of purrs to get better soon! And we are glad you are back! Target looks so cute napping there too! We also saw your comment at the NKC and have updated the links! Welcome back from computer inferno! Great to see you! We were wondering about you! We hope that the cheek abscess gets better fast! We hope Au's boo-boo is all healed up. Thanks for saying you like my pink nose!